Smart Bottoms newborn diaper, called "Born Smart", is an organic all-in-one. Find out what we liked about it and what we'd change in this review. I was super-excited when this tester diaper showed up in my mailbox - it is itty-bitty and absolutely adorable! And - in addition to being adorable, it's also very functional, which is just what you need with a newborn! All of Smart Bottoms' diapers are made in the USA and they offer free shipping within the USA too! 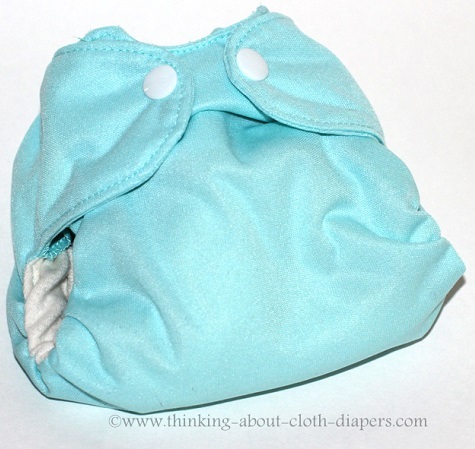 This diaper is constructed with an outer layer of PUL waterproof material. The inner is 3 layers of soft knit organic cotton, and it includes a snap-in 4-layer soaker. While this material does take awhile to prep (depending on the detergent you use, Smart Bottoms suggests 3-8 washes to reach full absorbency! ), it is super soft and only softens up even more with time! I will note here that natural materials are a bit more prone to staining, and the Born Smart was no exception. That said, newborn meconium and poops are water soluble and will wash out on their own over time (I found after a second washing they were basically back to normal), and stains also sun out easily. I tried a lot of different newborn all-in-one diapers, and the Smart Bottoms newborn had some unique features that I really liked. 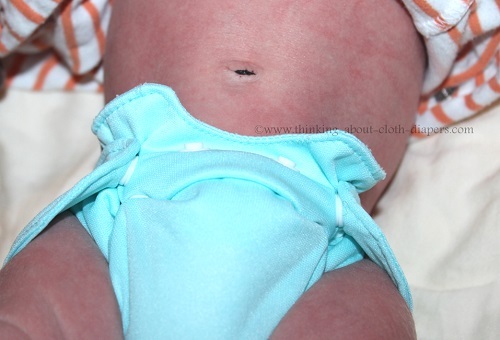 Umbilical cord notch: Most newborn diapers have snap-down umbilical cords which I found added bulk in the early days. Our hospital used a plastic umbilical cord clip that remained in place until the cord stump fell off, and this was one of the only diapers that didn't really catch on the cord clip. It was super easy to put on and gave the cord stump lots of room to breath so it could dry out and fall off! Non-encased leg elastics: You can see in the photo below - the leg elastic isn't stitched the whole way around, which means this diaper doesn't rub and leave red marks around the legs like some of the others I tried. You do have to make sure that the cotton inner material is completely tucked inside the outer layer to avoid moisture from wicking out onto your baby's sleeper, but I found this is just a quick check and tuck, and nothing to really worry about! 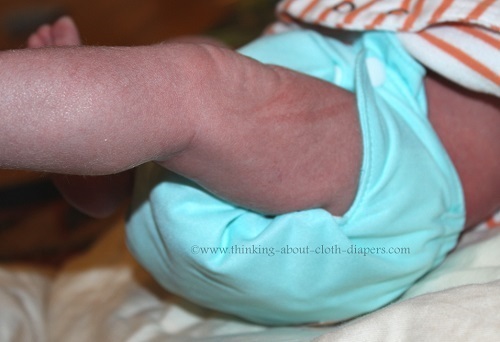 Trimness: With seven layers of absorbency, these diapers still offer a really nice trim fit! This was especially nice in the early days when babies are new and you don't want a massive puffy diaper on their tiny little bottoms. While the Smart Bottoms newborn diaper doesn't size down as small as Lil Joey newborn all-in-ones (which are designed to fit preemies as well), I found that the upper end of the size range (and absorbency!) was much higher than the Lil Joeys. With one row of rise snaps, this diaper does offer a reasonable range to fit and with the trim design, I think it would fit true to their suggested size range (6 to 16 lbs) - although every baby is a bit different, I would suggest up to 14 lbs for sure. If you are looking for newborn diapers that will fit and absorb until your one-size diapers offer a reliable, leak-free fit, the Smart Bottoms newborn diaper is a good option. My son quickly became a heavy wetter, and even with the included booster this diaper did not offer as much absorbency as my Blueberry Simplex and the Tots Bots Tini Fit (which also includes a booster). 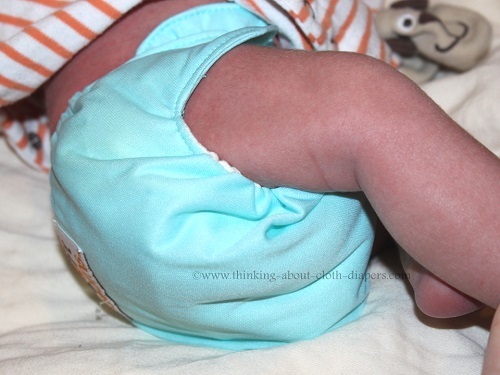 After the early newborn days, I found I needed to add an additional booster to the Smart Bottoms newborn diaper. 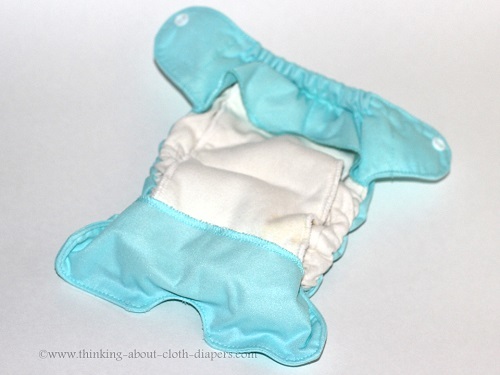 I added a 3 layer bamboo booster that I made myself, and this greatly improved the absorbency of the diaper without adding a lot of extra bulk. With that in mind, I would love to see another booster included with this diaper (or available as an add-on purchase). Yes, on a scale of 1 to 4 (with 1 being never, and 4 being absolutely! ), I give the Born Smart from Smart Bottoms a 3. I would certainly recommend it but would suggest additional boosters be purchased, too! If you want a newborn diaper without the bulk around the umbilical cord and organic materials are important to you, then this is a great little diaper! At $18 each, the Smart Bottoms newborn diaper is in the middle of the price range for mainstream newborn diapers (and on the lower end of the natural material all-in-ones). Smart Bottoms offers a 45 day money-back guarantee, too! Smart Bottoms sells diapers directly from their online web store. You can also support Thinking About Cloth Diapers if you purchase them from our affiliate Little for Now, with free shipping on orders over $39. 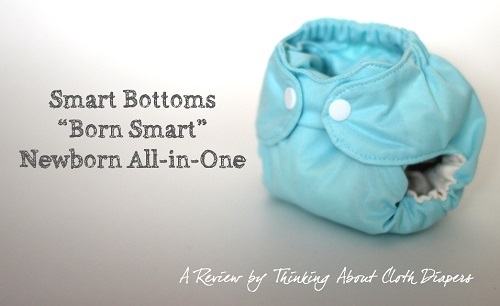 In conjunction with this review, Smart Bottoms has generously offered one lucky reader of Thinking About Cloth Diapers a chance to win a Born Smart newborn all-in-one in their choice of color/print! Please enter using the Rafflecopter form below! Disclosure: I received this diaper free from Smart Bottoms to facilitate this review. The opinions expressed in this post are entirely my own, and your experience with the product may differ from mine. I only recommend products or services I use personally and believe will be good for my readers. This post contains affiliate links. I am disclosing this in accordance with the Federal Trade Commission’s 16 CFR, Part 255: “Guides Concerning the Use of Endorsements and Testimonials in Advertising.” For more information, see our Disclaimer and Copyright.